Touching Tiny Lives in Lesotho: Babies! Reid wrote about Mokete after the first day of seeing him on outreach, when he was little more than a skeleton wracked by HIV and TB. 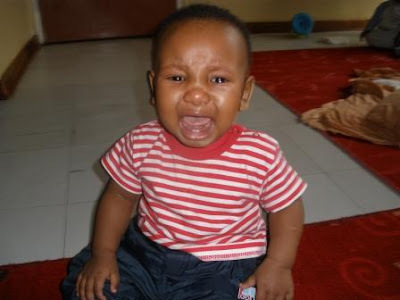 Now on plenty of medication and considerable bowlfuls of “papa le nama” (papa, the traditional corn meal porridge, and meat—some of Mokete’s first words at TTL), Mokete is turning into a funny and active three-year old little boy. Still preferring to cuddle on someone’s lap than run around, he has also proved to be a leader of the other older kids, often chiding them, “Uh unh Semethe, Uh unh” with a wag of his finger. 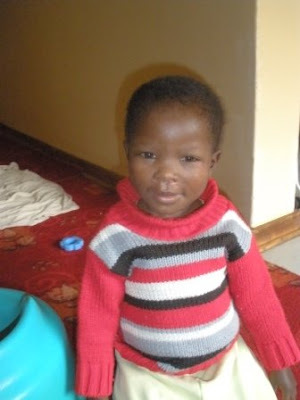 Matseliso, also three-years old, came to us in December because her mother was in the hospital and she was receiving insufficient care from her father. When she arrived she was acutely malnourished, and with a huge abscess on her stomach. She also tested positive for HIV. Over the past month and a half she has fattened up considerably, her abscess has healed, and she has become the chattiest member of the playroom. She loves playing games, especially one which involves “pepa-ing”—strapping a doll to her back in imitation of how the bo’m’e traditionally carry babies. 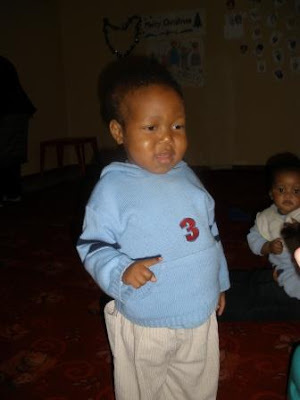 Semethe arrived within days of Matseliso, an acutely malnourished two-year old. Though he is HIV-negative, his situation was critical because he had fallen ill with vomiting and diarrhea just after his mom gave birth to a second baby, and was not receiving proper care. 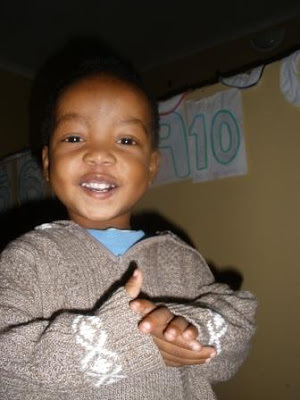 By the time we returned from our Christmas break, Semethe had transformed from a silent and withdrawn child into a little boy who tears around the room, laughing and getting into everything. He is also very affectionate with the other children. We refer to Tsepo as “grumpy Tsepo” because, though he has been here as long as any of the babies, he absolutely howls any time a white person so much as looks at him. Reid has tried to remedy the situation by holding him (a kind a Ferberized-method of affection), but with disappointingly little gains. On the upside, Tsepo’s health continues to flourish, and he will be reunified soon with his grandfather (a septuagenarian caring for several other grandchildren). Perhaps we can get him to crack a smile at us before he goes…. Stay tuned for the next installment of the little guys!